Listen to find out how to talk about what food you have at home – and to review countable and uncountable nouns. What’s in your fridge? ในตู้เย็นมีอะไรบ้าง? Are there any apples in your fridge? No, there aren’t any apples in my fridge. Is there any cheese in your fridge? Yes, there is some cheese. Do you want some? Are there any carrots in your fridge? Yes, there are some carrots. Is there any juice in your fridge? No, there isn’t any juice. ง่ายนิดเดียว แค่นี้ก็คุยเรื่องอาหารที่มีอยู่ในครัวเป็นภาษาอังกฤษกันได้แล้วนะคะ อย่าลืมนำไปฝึกบ่อยๆ กับเพื่อนด้วยนะคะ แล้วกลับมาฟังบทสนทนาสำหรับฝึกภาษาอังกฤษกันได้ใหม่ในคลิปหน้าค่ะ Bye! Are there any ______ in your fridge? No, there aren’t any ______ in my fridge. 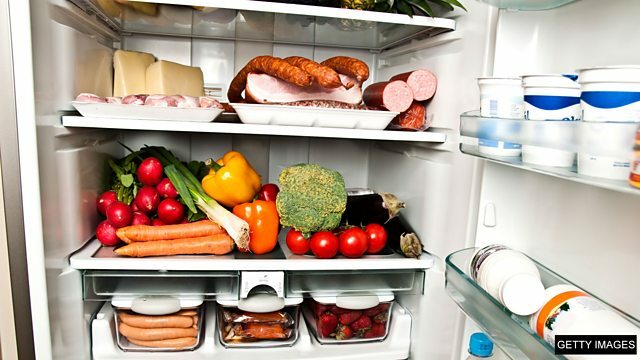 Is there any ______ in your fridge? Yes, there is some ______.